Need to import transactions, but the format is not supported? Convert PDF to OFX and import into MS Money, Sage One, Xero, YNAB, AccountEdge, Bankivity, Ace Money. Extract transaction data from text-based PDF files from your bank. Easy to use secure solution to review/convert your transactions and import into your accounting software. Convert PDF to OFX and import into MS Money, Sage One, Xero, YNAB, AccountEdge, Bankivity, Ace Money. Create importable OFX files. Review transactions in a readable view before converting. Free trial (up to 10 transactions per file converted) is available. Support is available before and after purchase. Fill the Excel range with unique random numbers, integers, real numbers, dates or strings in just one click. Generate passwords, do random sorting in rows, columns or a range, and fill selected cells with random values from Excel custom lists. CogeNET e` un gestionale di nuova generazione flessibile, affidabile, integrato che consente di adattare facilmente la strategia aziendale alla evoluzione del mercato e alla necessita` di adottare nuovi modelli organizzativi. Need to convert a transactions file to easy to access or archive format? Convert QBO to PDF and open in any PDF viewer. 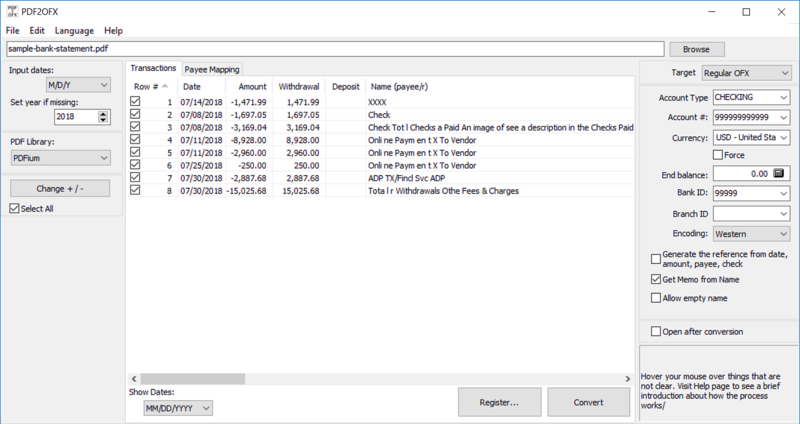 Review transactions in a readable view before converting. Free trial (up to 10 transactions per file converted) is available.